Sindo claims financial performance of no other Irish media company “comes close to it” – oh, how right they are! It is a Bank Holiday in Ireland today, and most of our politicians have repaired to the beach with their buckets and spades, so the usual Sunday political slot is this week given over to the media. And on this Sunday, there are two matters of considerable concern which suggest there is something deeply rotten in our media. This week, Ireland’s state broadcaster, and by far the biggest TV and radio broadcaster, RTE published its annual report for 2011. The headlines above are typical of the reporting that greeted the financial results. Yes a €16.8m deficit is bad. 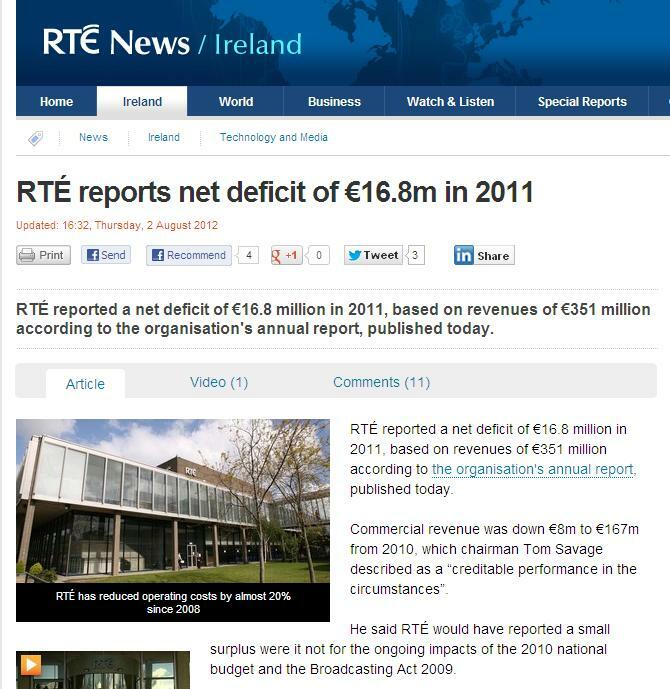 But not one media outlet reported the far more serious underlying financial mess in RTE that actually transformed the €16.8m deficit into an overall loss for 2011 of €69m. 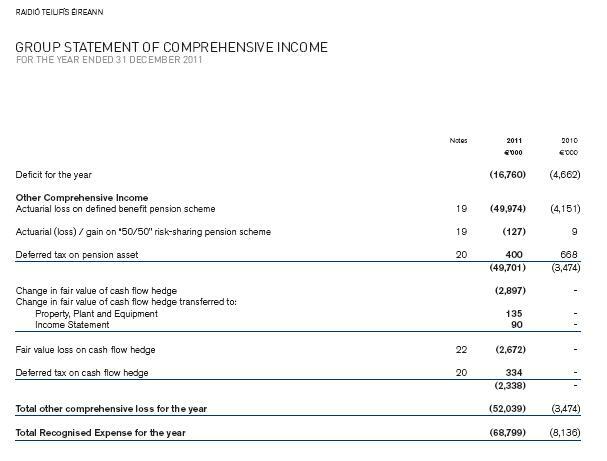 Yes a €69m loss in 12 months, with the culprit mostly being the RTE pension fund which needs more lolly. And if you think this deficit in the pension fund is some notional loss that won’t affect RTE or your viewing or listening experience, think on, and see the second concern below at the bottom. RTE’s equity/retained earnings in its balance sheet fell from €137m in 2010 to €69m in 2011. RTE’s loans went from zero to €38.25m – these losses are real! Some people criticise RTE for not reporting the news, and spinning the news because RTE is variously a liberal, pro-IRA, anti-IRA, anti-Church, right-wing, Dublin 4, provincial, left wing, pro-Government mouthpiece, Christian fundamental, anti-Government mouthpiece, West Brit Republican news organisation. 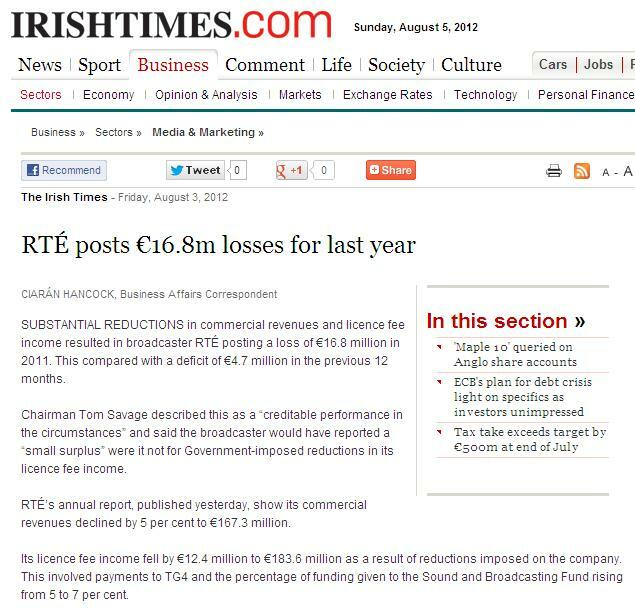 My experience of RTE is that it is a reasonably straight outfit, and the more depressing reality is that last week, it probably didn’t report the €69m loss, not because it wanted to mitigate bad news and present a more positive story but simply no-one read the accounts. No malice or propagandising, just incompetence, laziness, groupthink or copying what other media organisations report, or lack of resource. And it’s not just RTE. I was expecting other media companies – especially those which compete with RTE and which have made it known they think some of licence fee should be diverted to their own organisations to support their public service output – to remedy the omission in RTE’s reporting. I was especially expecting Ireland’s most combative media group, Independent News and Media (INM) to pick up on the colossal annual loss. 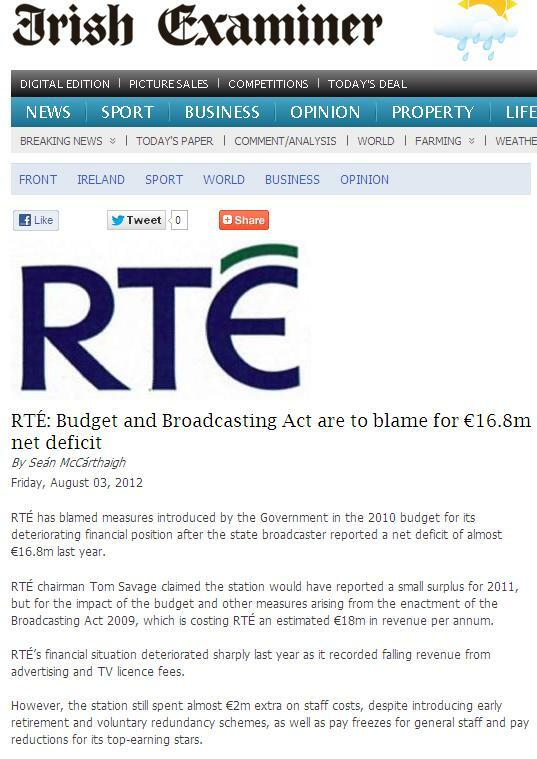 But it didn’t, and in fact not a single mainstream media outlet did report an overall loss of €69m. I say “not a single” one because there is nothing on the Internet, and if a broadcaster did pick up on the loss, then you would have expected it to be re-reported. And it wasn’t that INM wanted to do RTE any favours. Take a look at its reporting of RTE’s results in today’s Sunday Independent, which I reproduce in full below for the copyright-exempt purpose of analysis and comment but also to allow for extensive mickey-taking. Seriously Anne, did you think this ill-deserved schadenfreude would go unnoticed?! Whilst overlooking the €50m pension loss at RTE, INM has a customary dig at RTE. No surprise there. Except, in 2011 INM itself made a full year net loss of €41m after a €95m exceptional loss. Its turnover fell in 2011 by €68m from €626m to €558m. It is balance-sheet insolvent with net liabilities of €23m. It has net debt of €427m. We will get the circulation figures for its stable of newspapers for the first six months of 2012 from the UK’s ABC company in the next week or so, but you can expect to see INM’s newspaper sales to continue their pretty calamitous recent performance – in the second six months of 2011, sales of the Sunday Independent fell from 257,614 to 232,697 and the Irish Independent fell from 133,157 to 117,149 and the Evening Herald fell from 62,515 to 60,374 and the Belfast Telegraph fell from 56,499 to 51,880. Meanwhile, during the same period, the Sunday Business Post circulation increased from 43,408 to 44,480, the Irish Times increased from 94,285 to 94,944 although the Irish Examiner did fall from 43,406 to 40,528. In 2011, RTE’s income fell 6% from €372m to €351m, less than INM’s decline, yet INM has a pop at RTE’s revenue performance. INM has a pop at Thomas Crosbie Holdings, publisher of the Examiner and Sunday Business Post and points out it has €28m of bank debt. That compares with over €400m owed to the banks at INM. INM can’t even set up a proper pop at the Irish Times which did indeed record a pre-tax profit of €2.1m in 2010 compared with a loss of about €40m at INM in 2011, But the Irish Times actually recorded an operating loss in 2010 of €633,341 but was saved, mostly by a credit on its pension fund of €5.1m. Although not mentioned by the Sunday Independent today, TV3 or rather Tullamore Beta Limited recorded an operating profit of €356,000 in 2010, but even TV3 has problems with Anglo Irish Bank apparently agreeing to “park” a loan until the TV3 backers sell their stake. “Park” means stop making interest or capital repayments apparently. 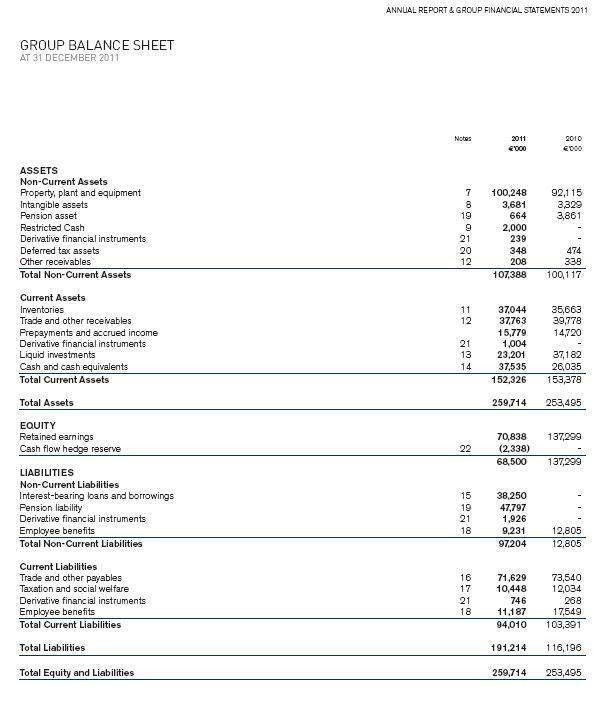 INM recorded a net loss of €41m in 2011 but in the Sunday Independent today, it conveniently confines itself to reporting operating profits. 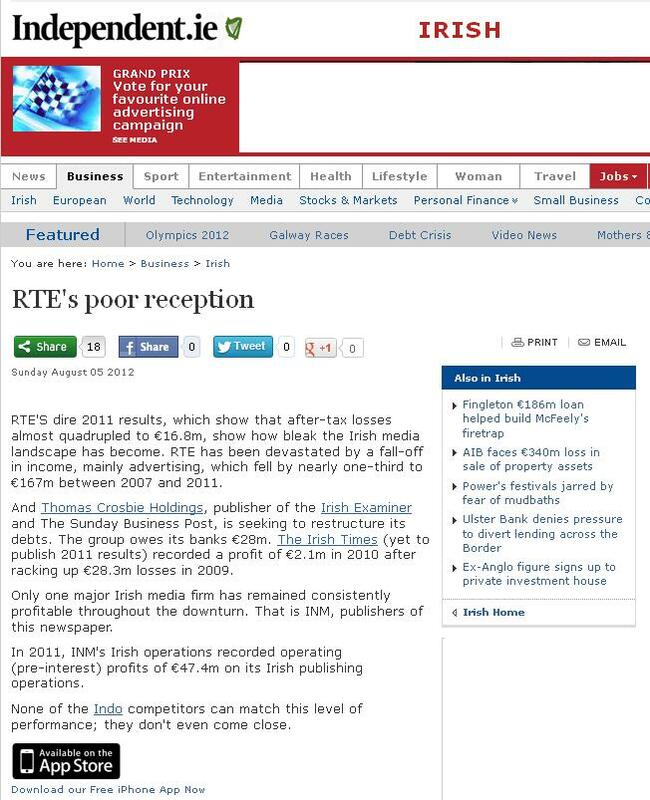 In fact, after RTE, INM was the Irish media company with the biggest loss in 2011. After RTE and INM, the “others don’t even come close”! And the second concern about our media? Take a look at what you are missing tonight from the UK’s freeview service. This is a free to air service which requires a set-top box that costs a one-off of about €10 though in the UK these days, most TVs have the freeview receiver built in. In other words the freeview service is practically free. In the UK today – and that includes our neighbours across the Border in Northern Ireland – they have access to 40-plus channels including four news channels. Take a look at tonight’s schedule for the range of films, drama, sitcoms, sports and current affairs. Now take a look at the equivalent Irish Saorview offering, the receiver for which you might have paid €100-150, a receiver which bizarrely is not compatible with the UK’s freeview. Feel short-changed? 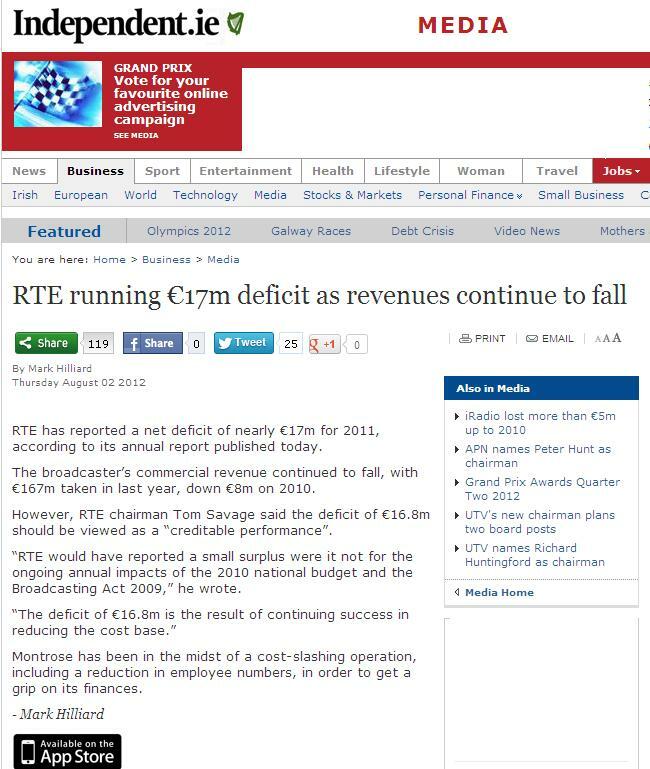 Perhaps if RTE hadn’t run up a €69m loss last year, it might have used some funding to help close the gap. Not for the first time, or indeed the second time, but for the third time today NAMA is flailing about, trying to defend the sale of a property which was not placed on the open market. And this time, the buyer is a NAMA employee who is now according to some reports, an ex-employee. John Mooney in the Sunday Times broke the story this morning – the article is here behind a paywall. NAMA has already sold two substantial landbanks, both on the outskirts of Ireland’s second city, Cork in controversial circumstances. In the first reported in January 2012, the sale of 125 of land for €3-4m merited a “for sale” sign stuck up in a field. The second – 450 acres sold in April 2012 for around €7m – didn’t even warrant a “for sale” sign and was sold off-market to a private buyer. Despite there being a paucity of transactions in the State, NAMA unconvincingly assures us that it achieved good prices for both sales. Fianna Fail’s flaky senator Mark Daly has been trying to get a new Bill introduced in the Seanad which would force NAMA to make sure all property for sale under its auspices was publicly viewable and transparent. Alas, his Bill was shot down by parties who have a majority in the Seanad and those same parties failed to propose an alternative. Today’s news is that NAMA sold a five-bedroom house to an employee. NAMA is reported to be claiming that “at this stage” there is no evidence that the house was sold below market value. And frankly, were it not for the fact that the property didn’t come onto the open market where its price might have been tested, this would probably not have made the headlines. After all, what is wrong with a NAMA employee using part of his average salary of €103,000 to buy an Irish property? But yet again, NAMA is on the ropes defending its procedures and says that it has ordered its internal auditors, Deloitte, to investigate the matter. Apparently the focus of the investigation will be whether or not the employee, or ex-employee, disclosed the purchase, which seems a lot like closing the stable the door after the horse has bolted. NAMA claims generally that it cannot offer its developers’ property for sale as this would mean NAMA was disclosing confidential information – after all, if you borrowed €10m from Bank of Ireland to develop a property which you were now offering for sale, you wouldn’t want Bank of Ireland advertising the fact that you had a loan. What NAMA conveniently overlooks is that these sales will generally mean there is a shortfall or default on the repayment of the loan. And the shortfall is being picked up by you because you are paying for the bailout of the banks. And in those circumstances where there is a shortfall, we want to know that NAMA and the developer did their level-best to get the best price. So there is little sympathy for the Agency here today, because it might have facilitated the development of procedures to avoid these accusations of chicanery. But the main blame must lie with our legislators – TDs and senators – who have failed to help NAMA demonstrate it is operating so as to maximise the returns from its assets. UPDATE: 6th August, 2012. The employee at the centre of the above storm is Enda Farrell, a portfolio manager at NAMA who left the Agency in April 2012. It is said that he, together with his wife Alice Kramer bought the property from a NAMA developer, Thomas Dowd (Tom Dowd), an associate of Derek Quinlan. The property is called Ladywell in Lucan west Dublin. It was bought for €1.2m by Tom Dowd “about 10 years ago” and the purchase price “earlier this year” is said to have been €410,000. According to the Irish Independent today “He denied yesterday using insider information to target the house owned by Mr Dowd, saying it was public knowledge that the property was in NAMA. He added that the house was unoccupied and in bad condition, so it was reasonable to assume it was for sale. He then approached Mr Dowd directly.” Sounds fishy because the property is not apparently on the January 2012 NAMA foreclosure list.